The sector of work I am in often requires me to travel to meet clients, sometimes this means travelling a little further out to places such as London. When I do these client meeting there are a few essentials I always pack with me and I am going to share them with you. This is obvious carrying a note pad, my printed presentation folder and I often take at least 3 pens with me. You never know with pens running out so it's convenient to have a spare in your bag when you need it. I would personally avoid the cheap bic pens and take something a little nicer or perhaps a branded pen from your company. This is a must so I can check my emails throughout the day and reply to the odd one. The other obvious reason is if you get lost you can have a quick search online / google maps. Also I find the London underground apps amazing as I am awful when it comes to tubes, however I manage to get to where I need to with these apps. Lastly whatsapp keeping in touch with the guys in the office and not missing out on any office banter is always fun! One of the most important things to carry and I always have a charged up one in my handbag now. For a long day which includes a train journey your battery will die very quickly with you being on the phone for quite a fair bit of the journey. We are so reliant on our smartphones and tablets, there is nothing worse than running out of battery. 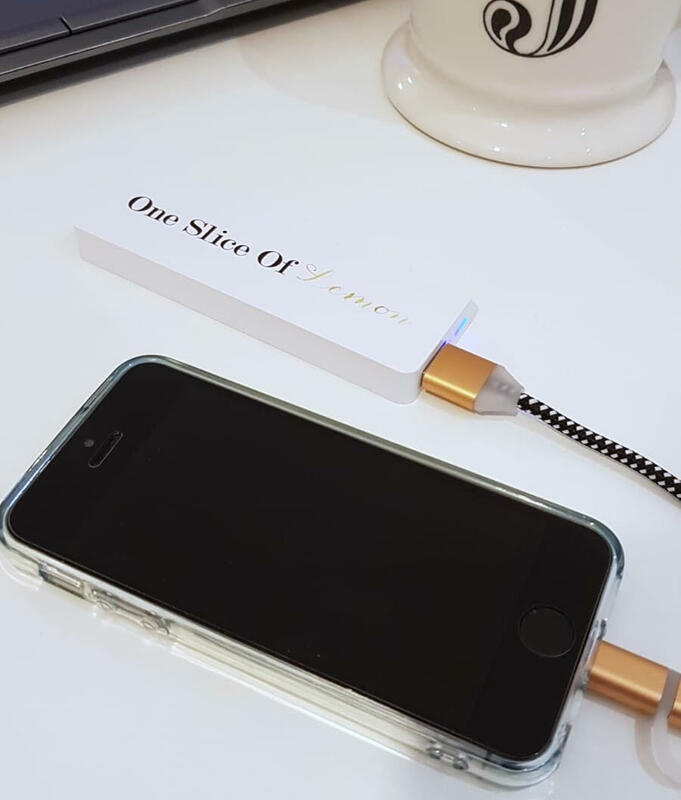 If you have used them before they come with the USB cable to connect your phone or tablet. These are great as client gifts as everyone can make use to one rather than the standard pens / pads / stress balls people give out with branding. I received these branded power banks from USB Makers and they have gone down a treat in the office. I didn't actually have enough to go round the office. Everyone was actually surprised by how small light weight they are now. The one I have at home is the size of an iphone and probably twice as thick as the iphone. This one you can put in your pocket and it's so light weight it only weighs 70grams! On my last trip to London I found it much easier dashing around in my converses than shoes and it gave my feet the much needed comfort. When you are not use to being on your feet all day long getting on / off tubes / taxis and often speed walking around it's a must. Just change them round the corner before you get to your destination. Miniature perfume to freshen up but nothing over powering and mints are always handy to have. I always carry a mini pack of water wipes they come in handy every time especially for London as I find it very dirty. When you are out it sometimes mean you are not able to have lunch at lunch time with meetings over lapping possibly or you become peckish before the journey home and you didn't have time to grab a snack. Energy bars are often easy for a quick top up to tie you over until you have time to eat. I always have a bottle of water filled up to take with me. When you are dashing around it's nice to be able to have a sip when you get to each of your destinations before your meeting.